Elijah Wald expertly recreates the (in)famous Newport electric set, shifting perspective amongst Dylan, Seeger and others to fans in the crowd and even the beleaguered sound man. Bob Dylan has notoriously been dismissive of those authors who choose to write about his long, varied, and multifaceted life. There’s a quote somewhere out there in which he essentially tells these writers to “get a life”; the implication being that their own lives are far more worth examining than his own. However, with seemingly a couple of new volumes revolving around Mr. Zimmerman appearing each year on bookshelves, writers haven’t quite taken their idol’s words to heart. For the most part, that’s a good thing. A figure as complex and beguiling as Dylan deserves examination, account, and appraisal. As arguably the most influential character in the modern folk musical canon, and someone who still regularly releases new albums while spending over 100 nights a year on the road, his life is rich in detail and ripe with anecdotes and encounters that beg for further assessment. One of his most famous (or infamous depending on your viewpoint) periods was his three year run at the famed Newport Folk Festival that legendarily culminated with his shocking electric set that figuratively set the folk music world aflame in July 1965. When Dylan took the stage backed by multi-instrumentalist Al Kooper and the rollicking Paul Butterfield Blues Band, things changed instantaneously. All due to three sloppily played and under-rehearsed songs, neither Dylan’s career nor the concept of the Newport Folk Festival would ever again be the same. To coincide with that event’s 50th Anniversary, author and renowned folk music enthusiast Elijah Wald delves deep into this period of Dylan’s career, offering over 300 pages worth of festival history, influence, and perspective with both Dylan’s positively received contributions and his ultimate attack upon its’ ideals looming in the background to tie all the pieces together. The story’s climax and the event that grants this book its’ title comes well into the proceedings in chapter ten and places the reader right into the thick of things. Sunday, 25 July “dawned muggy and overcast” as the morning’s religiously themed performances were sparsely attended and the afternoon events groggily unfolded. This may have been due to the attendees’ festival fatigue” or the weather, but as Wald tells us, Newport was a communal event where performers mixed with their fans after the shows had ended, merrily and drunkenly trading songs deep into the night, often pausing only when the sun rose. Dylan himself was sound asleep when the day began to materialize, having pulled an all-nighter alternately riffing with his guitar and hurriedly rehearsing for the next night’s events with his hastily assembled crack band. What was at the heart of the matter Wald tells us, and a source of consternation for festival honchos Pete Seeger and George Wein, was the crowd’s urgent desire to see Dylan. Moving ever closer to full-fledged rock star and less of an embodiment of the folkie who had naively charmed the Newport crowd two years earlier, Dylan was beginning to separate himself from the likes of Peter, Paul, and Mary, The Kingston Trio, and even his friend and ardent supporter Joan Baez. Dylan’s fans were also growing bolder with their cheers and proclamations and were not afraid to voice their excitement for his arrival and their frustration at some of the acts that were leading up to his performance. When that appointed time finally arrived (earlier than scheduled as it turns out due to mysteriously phrased weather concerns) Dylan and Co. plugged in and set the scene in motion: “I ain’t gonna work on Maggie’s farm no more” snarled Dylan amidst howls of feedback and distortion. What soon became clear was that either by choice or by order, Dylan would indeed no longer be working on Mr. Seeger’s farm no more. Wald expertly recreates the electric set, shifting perspective from Dylan to Al Kooper to guitarist Mike Bloomfield to Pete Seeger himself who for the record denies the legend of attempting to cut the band’s power cords with an axe. He does cop to his disappointment, telling his father the following day: “I thought he had so much promise.” Wald also includes insightful recollections from crowd members, some of whom react with bemused indifference, others with mild irritation, and one who tellingly implies that the famous boos heard around the world were simply being uttered as a result of the poorly mixed sound feed that was blasting improperly out to the crowd. Ever the attentive writer, Wald even offers a couple of paragraphs for sound man Bill Hanley to defend his work. While Dylan’s electric set proved to be the watershed moment of the Newport Folk Festival, it was in totality just one small part of the larger picture. The nine chapters of Wald’s book that precede the electricity focus on forming the context that allowed this event to become so completely shocking. 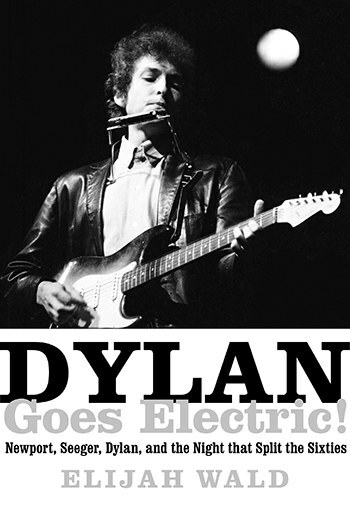 There’s great material on Dylan’s early days in Minnesota when, as a precursor to going electric at Newport, he performed so raucously at a school jamboree that the principal was forced to cut the electricity. There’s also a great deal of focus on those besides Dylan who brought so much to the Newport stages. Seeger, George Wein, Peter Yarrow, Alan Lomax, and Theodore Bikel, despite having many varying musical opinions formed the crux of the curating committee for the yearly festival, doing everything from scheduling and logistics to sound checks and performing themselves. Joan Baez was a favored daughter, gaining loads of performance time and frequent sit-ins with almost whomever performed, while Peter, Paul, and Mary, and The Kingston Trio typically topped the bill. It proved eye-opening, however, the amount of diverse talent the festival organizers were able to bring in with artists like The Kingston Trio, Johnny Cash, and Odetta in the early years morphing into Chuck Berry, Van Morrison, and Howlin’ Wolf in later festival iterations. Wald also gives attention to the changing nature of politics, national affairs, and social activism that was ever present throughout the turbulent 1960s. As the country’s youth changed and morphed, the repercussions were felt by the festival which struggled at times to connect with the desires and preferences of its’ audience. In hindsight, it should have been evident to all of those involved that Dylan was reaching for something other than the traditional protest and working man songs that he had used to first endear himself to the Newport community. Having already made an album or two of material featuring electric instruments and having already used his previously allotted set times to perform surrealist tracks like “Mr. Tambourine Man” clearly proved that Dylan was marching to his own beat whether people were pleased with his choices or not. While Seeger and Dylan were able in time to somewhat patch things up and perform again at various points, it’s clear that July 1965 definitively marked a line between folkies and rockers, traditionalists and neo-ethnics alike. History has shown that people will continue to show an interest in this stage of musical history. Just last month, after years missing, the Sunburst Fender Stratocaster Dylan played that night at Newport reappeared on the Newport grounds to be passed around by current torchbearers and those still hanging around from the original days. Dylan’s magical, controversial night shows no signs of losing life.